Water is essential to all of life, and in a dry land, water is precious. Before Alpine existed, the only reason man or animal stopped here in this valley was the spring that welled up out of the earth. And, water caused the railroad to build a stopping place here in 1883. And, because the railroad stopped here, people discovered this valley in the middle of the Chihuahuan Desert and began to build places of life, commerce, and worship. People brought their faith with them into this vast desert and its mountains. The railroad provided a physical link to the rest of the country and brought the structures for faith experiences to the people who had a desire to worship. The Baptists led the way, being the first faith group to hold a worship service in this community, then called Murphyville. In the spring of 1885, Rev. George W. Baines, traveling on the train from El Paso, stopped in Murphyville and held a religious service in the Southern Pacific Depot. The First Baptist Church of Alpine was organized April 14, 1893. The church began with nine founding members–eight women and one Texas Ranger turned rancher, Julius C. Byrd. For twelve years the group met in different buildings. In October 1894, the young congregation called their first pastor, Rev. D. B. Rose, and the following year constructed a small adobe building on the corner of Fourth Street and Avenue D (the present site). The present church sanctuary was built in 1916-17 under the leadership of Rev. James Tartt. After the debt was paid, the church was dedicated on June 13, 1926. Rev. L. E. Millican, the "Cowboy Preacher," led the dedication service for the new sanctuary. 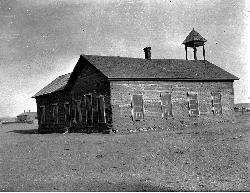 Millican, one of the colorful preachers of the "old west" had also led the dedication event for the adobe building in 1895. FBC has always demonstrated a mission vision–offering the life giving water of Christ beyond the doors of the church. The congregation began a mission work among Hispanics who were living in the community as early as 1908 when they organized Mexican Baptist Church with a membership of fourteen. Mrs. Lula Murphey and Mrs. Jesusita Arriola dedicated themselves to the work in its early years. In the late 1940's, with the help of the Southern Baptist Convention's Home Mission Board, the church built a building on East Avenue G. The church was renamed Emanuel Baptist Church. FBC's mission vision extended to the students at Sul Ross State University. The Baptist Student Union began in 1948. By 1951, the BSU moved into the building which is still being used. 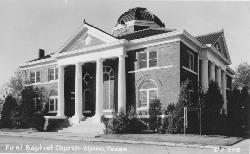 The building was built with some funds from Alpine but largely with financing from the Baptist General Convention of Texas. FBC continues to be the largest local contributor to the student work, which is now called the Baptist Student Ministry (BSM). The church also started a mission in Pilares, Mexico in 1968 (the church no longer exists). The church also assisted and sponsored Second Baptist Church (now Hillside). In 1956, FBC built the two story brick educational building under the leadership of Pastor Ralph Wooten. The long range plan was to build a new sanctuary extending from the educational building (which is why the second floor does not extend to the end of the building). However, the congregation could not part with the beauty and the tradition of the existing ornate structure, ultimately rejecting the plans for the new sanctuary. In the early 1970's, the church did remodel the sanctuary. FBC takes an active role in the work of Paisano Baptist Encampment. The camp was founded in 1915, primarily as a camp where cowboys and ranching families could gather once a year. The church originally built and owned three of the "family" cabins across from the Tabernacle in the center of the camp. Two of those cabins have been donated to the Encampment.. In the early 1960's the church built a dormitory facility. Later, a church member donated a cabin designated as the Pastor's Cabin. So, the church today owns and operates three buildings in the Encampment. Philip McCraw, the FBC pastor from 1992-2004, served as the longest tenured pastor in the church's one hundred and twenty-two year history. During Pastor McCraw's tenure, the church made many renovations and improvements. In the mid- and late-nineties, the congregation spent a lot of time, money, and effort enhancing the sanctuary, restoring the priceless stained glass windows, and refurbishing the interior with new color. In 1993, FBC, with the cooperative assistance of other Baptist churches across the state, remodeled and renewed the building at Emanuel Baptist Church and began a new ministry with a new name: Friendship (Amistad) Baptist Church. In 2000, Friendship officially became a satellite congregation, instead of a mission church--unifying two congregations into one. The Friendship location offers Bible study and worship in Spanish. Expanding it's mission vision, in 2001 FBC agreed to add a new national Baptist convention, the Cooperative Baptist Fellowship, to the mission agencies which the church supported. Today, the church faithfully contributes to and participates in the mission and ministries of an expanding list of organizations, including: the Big Bend Baptist Association, the Baptist General Convention of Texas, Rio Pecos Baptist Association, the Southern Baptist Convention, Cooperative Baptist Fellowship, the Baptist Student Ministry, and Paisano Encampment. Kenneth Jordan was the pastor of First Baptist Church of Alpine, from February 2005 through August 2011. Brother Kenneth had a passion for reaching the lost in Alpine and beyond. A renewed focus on Children & Youth ministry marked his first 2 years here. A vision to develop a Kingdom mindset led FBC to assist in the planting of Big Bend Cowboy Church . The church called Dr. Chris Powell as Pastor in February 2012. Dr. Powell has led the church to focus its vision and join God on the mission that has been established for the church. FBC continues to strive to offer quenching renewal to thirsty people in the Big Bend area of Texas and beyond. First Baptist Church has offered "over a century of caring, ministry, and leadership in the Big Bend area"-- "a place where lasting friendships are made." Historic photos of First Baptist Church buildings. Photos courtesy of: Archives of the Big Bend Bryan Wildenthal Memorial Library, Sul Ross State University, Alpine, Texas.